Now, I am not a morning person, so as a teacher I have to make sure to prepare and be ready. I don’t want any of my kiddos to be victim to a cranky teacher attack! (I’m making a poor joke there, sorry! There is no attacking in my classroom except for the next task of learning at hand!) One way I do this is by creating morning work templates that are bright, cheery, and easy to edit for every morning. These clearly explain what students should do in the morning and help develop a solid routine. 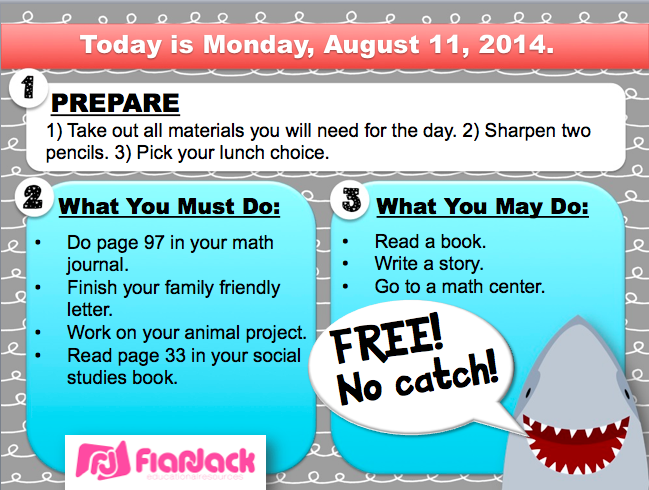 My Shark Week freebie is a set of editable templates in PowerPoint with a fun shark theme your students will get a kick out of. Click here or the image below to download your free copy. 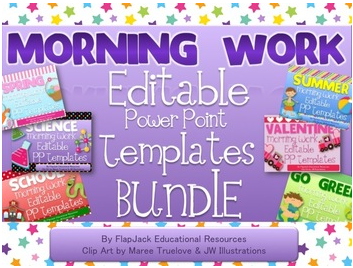 If you enjoy these, I have the following bundles that provide seasonal morning templates to last you all year long. Oh, I love this! I think it's so important for kids to see what their day will hold, and seeing a shark up there would really get my kids interested for the day. Thanks for sharing & linking up with me 🙂 Great taste in clipart, too!